There was panic at the Limbe Community Field on Friday night when the tyre of a car blew off around 10:00pm along Nambeke Street and made a loud sound that scared locals and especially those who were attending the evening concert at the Limbe Festival of Arts and Culture (Limbe FESTAC) village. It was gathered that attendees at the Limbe FESTAC village at the Limbe Community Field were panic-stricken and were about running out of the festival grounds before they were reassured by the authorities that everything was under control. Other locals are said to have been terrified by the incident, with others taking to social media to announce that Limbe was under an attack with gunshots renting the air. The fear was even more real given that separatists fighting for the independence of the self-style Ambazonia state had promised to frustrate Limbe FESTAC. Impeccable sources at the Limbe FESTAC grounds said it was a tyre puncture and not a gun attack. “It was a tyre puncture. Limbe is doing fine and FESTAC is ongoing. Thousands of persons are attending the concert and X-Maleya is expected on stage in a moment,” a festival attendee said Friday night. The Limbe Festival of Arts and Culture, in its 6th edition this year, wraps up today April 13 after it was opened on April 6. 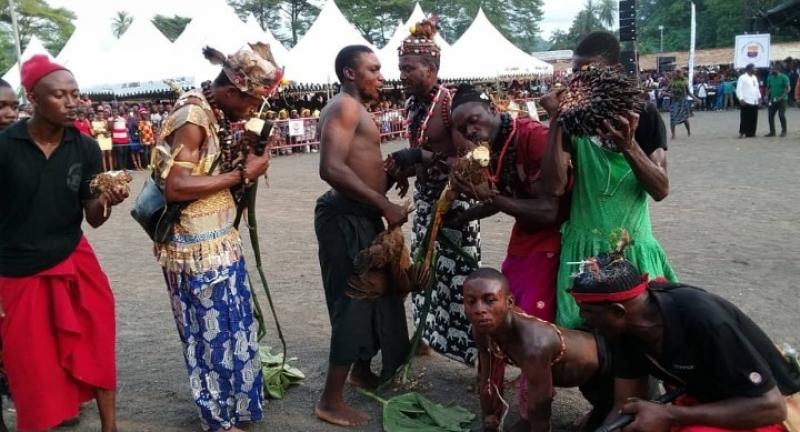 Separatists had vowed that the festival will not take place, but the authorities and locals have since staged a successful Limbe FESTAC 2019. It has been eight days of celebration of Cameroon’s rich cultural heritage, a show of Cameroon’s unity in diversity. Since 2014, the festival has brought together cultural lovers across Cameroon, with participating delegations from other African countries. Limbe FESTAC is characterized by cultural parades, traditional dances, gastronomic displays, carnival, marathon, canoe race, wrestling and a beauty pageant, garnished with a raffle draw this year. Void of any tribal or ethnic coloration, the Limbe FESTAC is about the biggest cultural event across the country that celebrates all the cultures of the people. The event held this year within the context of the deepening crisis in Cameroon’s North West and South West Regions as well threats from separatist fighters. Separatists loyal to the self-declared state of Ambazonia had called for a 10-day lockdown of Fako Division. The lockdown, according to Chris Anu, Secretary of Communication and Spokesperson of the Ambazonia Interim Government, was meant to frustrate the Limbe Festival of Arts and Culture, reason why the tyre puncture got many moved. Going by Anu, such events like FESTAC should not be taking place in times of war, and especially at a time when people are mourning their loved ones. He added that the Interim Government had earlier informed the authorities of Limbe to put such a celebration on hold. But the popular show of defiance to the lockdown and the dictates of separatists may well be a message that the people of Limbe have taken their destinies into their hands.